Europe’s largest open air aquarium; covering three structures, fifty aquariums, and a thousand species of animals; is possibly responsible for about 60% of all European marine research! Polar Pavilion: Penguin Rookery, Seal Pool, Cold Oceans. Temperate Pavilion: Kelp Forest, Jellyfish, Eelgrass Herbarium, the AbyssBox, and the Touch Pool. Plan to spend nearly a whole day here if you want your money’s worth, especially if you’re here with your family. Wonderfully presented and easily accessible, this is Brest’s favourite attraction. Get the park map from the attraction website. There is a café, a bar and a brewery. Best to come on the weekend. Free car parking with reserved areas for the disabled and mobility impaired. The whole park is wheelchair accessible. Check out the souvenir shop. For staying overnight at Oceanopolis, check out the attraction website. All times given are for 2015. They may change in the coming year. Line 3 Lambezellec - Oceanopolis by Palaren. 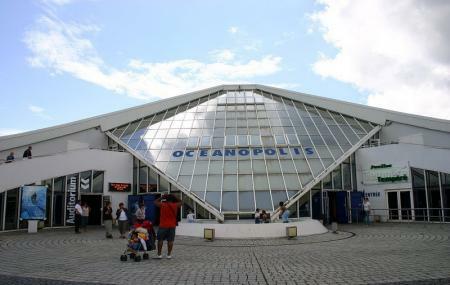 People normally club together Cours Dajot and Jardin Du Conservatoire Botanique while planning their visit to Oceanopolis. Beautiful place with three different exhibits. One for tropical fauna, one for Arctic, and a very unique exhibit for the Bretagne region. Informative, fun, and with English translations for everything. There is also an English audio tour. Had a great time. Food was a bit expensive, but that's what happens in tourist attractions. There is a space for picnics though, inside and outside, so you could in theory bring your own food in. Nice place, but far from being top of the line. Aquarium is impressive, but only tropical area - cold area lacks qnimals. I was impressed with size of some tanks. You can see some of the sharks quite up close and it was a great opportunity for some awesome photos and videos! I recommend a visit, but you will hardly want to return. We had a great time, well worth the money and great memories made. Exhibition, especially tropical 5star. Arctic 4 star. Massive downgrade as everything besides "thanks good bye" French only, this is a no-go in today's world with significant international tourists... Finally exhibition "Normandy" appears to be Gift Shop only..